Thank you to all those that came out to March Networks for a fantastic seminar (Smart Surveillance Systems: Trends and Recent Research) given by the University of Ottawa’s Dr. Robert Laganiere! Thank you to our sponsors March Networks and Kanata North BIA for allowing the initiative to take place. 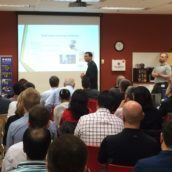 IEEE Ottawa Lunch and Learn is an initiative to bridge the gap between Industry, Academia, and Government, by bringing speakers from various sectors to the heart of the Kanata Tech Hub to provide technical talks in their respective areas of expertise. This initiative serves as a place to connect, communicate, and collaborate, as well enhance and promote Ottawa tech, research, and community. Based on the tech community turn out as well as audience questions and participation, the IEEE Ottawa Lunch & Learn initiative is well under way! Please take a moment to visit the newly updated IEEE Ottawa Computer Society Website (http://sites.ieee.org/ottawa-cs/) and join our newly created LinkedIn Group (https://www.linkedin.com/groups/8583201). Posted by Website Owner on 2016-11-29 at 11:07 in News.